When going on a vacation to the Disney Parks there is less time to take in movies, Disney or otherwise, however, that does not mean there isn’t fodder to sate your cinematic thirsts while there. Here are some of the sights I saw that met that requirement. 3D is a theme at many of these cinematic attractions, I stumbled upon this attraction with little knowledge of what it was but I absolutely loved it. It’s a great mix of new and old of Disney and music and it’s brilliant. Disney 360 presentations is the preferred mode of conveying the aural-visual message crafted by each nation’s tourism board that so chooses to have a film in the park. With the 360 the name is very indicative: there are projectors and screens above you that surround you on all sides. At times the visual you get is panoramic at others these screens show different imagery, which encourage you to turn yourself about such that you don’t sit to watch said film but rather stand in rows with a bar to lean on should you need it. I certainly tried to take in as much as I could here. The countries in Epcot with 360 films are China, Canada and France. The only country offering a tourism film not in 360 is Norway whose 5 minute short is added on to the end of their water ride. Ironically, it’s also my favorite of the films because it’s the most artistic and least hey-this-was-commissioned-by-the-tourism-board film of the bunch. Yet this isn’t the only place Epcot incorporate moving imagery. In Mexico there’s the Gran Fiesta Tour starring the Three Caballeros (Panchito, Jose Carioca and Donald Duck) where in they appear animated on screens many times, in all directions during your boat ride which is a great way to get a chuckle and cool off. Is clearly one of the more popular attractions at the park being a Star Wars flight simulator. The imagery is great and there’s little actual motion needed to suggest the movements. Another example of this if you’re really park-hopping can be found at Universal in the Spider-Man ride. Is a great little show with jumping out at you 3D imagery mixed with live performers (i.e. Muppets) in a wonderful theater which is built to replicate the Muppets’ performance space. 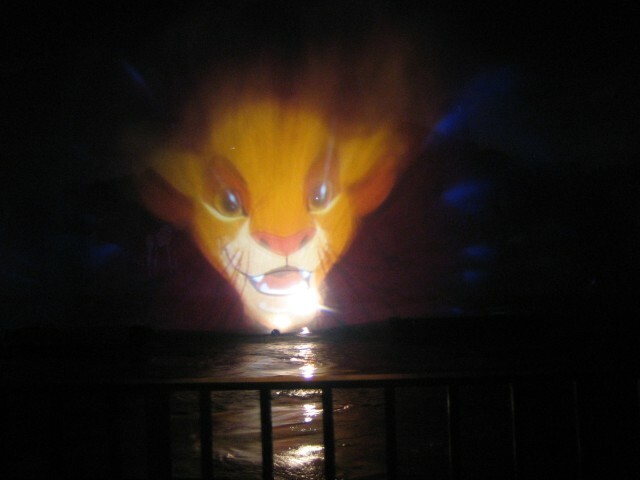 Is the night-time spectacular that closes the park. It features one of the largest conglomerations of characters you’re likely to find and features many images both old and new projected onto a wall created by water jets. There are also live-action shows like some stunt demonstration shows Indiana Jones Stunt Spectacular and Lights, Motors, Action; a great car stunt demonstration show. Then in this more film-centric park there are more literal films and exhibits like Walt Disney: One Man’s Dream and The Magic of Disney Animation. This is all just based on what I saw while I was at the park, there were a few things I missed that likely qualify. Ultimately, yes, it is a getaway but that’s not to say there aren’t alternate film forms that can be observed and admired both here and at other parks. Be on the lookout for them.